While no one wants to see your entire 180-minute reenactment of Hamlet, it’s nevertheless nice to have a camcorder handy once in a while. Usually I’ll bust out a pocket-sized Canon SD750 when I need a couple minutes of motion capture, but the SD750–as well as most other low-end digital cameras–aren’t fabulous at video, and can have issues recording single streams over a couple minutes. I’d love something in the prosumer class, but I simply don’t need video recording enough to justify the cost. And even if I did, I wouldn’t be able to fit it in with my normal photography equipment. The MinoHD is a 720p, 30fps, all digital video recorder roughly volume equivalent to an iPhone: thicker but narrower. Video is encoded in variable bit rate H.264 with AAC audio. (Perfect for use on a Mac.) 4GB of internal flash memory holds about 60 minutes of video, but the storage is neither removable nor interchangeable. The battery is also internal, and charges from the USB connection automatically. A tiny color LCD screen allows for playback and deletion of recorded videos, and provides no special recording effects such as useless cheesy color filter nonsense typically present on consumer camcorders. Costco retail pricing is $179. Recording a movie is as simple as turning it on and pressing the big red button. Hit the big red button again to stop. It took me approximately 10 seconds to master the process. (An intelligent dog could be trained to do the same if the buttons were bigger.) Use of the “FlipShare” software is not required to transfer video off the device. Just plug it in to a USB port and move the files off. If you choose to use FlipShare, it provides basic video management and editing capabilities, and appears to be necessary to update the MinoHD’s firmware. I’m using FlipShare for now, but like the option of not using it. No special software required for day-to-day use. Highly recommended for those wanting a cost-effective HD camcorder for light, periodic use. When it comes to “good” event photography, it’s a misconception that a given photo is representative of the entire event condensed down to a few well-framed shots. My process is both equal and opposite: to mislead the viewer into believing a few highly manipulated fleeting moments reflect the larger context by pleasing the eye with consciously undetectable lies. Flat-out, bold-faced, deception. Photography is about contorting perceptions of reality. We want to believe the handful of infinitesimally small glorious moments at our weddings, birthdays and holidays represent the way people felt the entire time, when they really only capture less than 1% of the entire event. Don’t believe me? Watch a wedding video. The whole thing. Booooooring. No one really cares about the 45 minute toast or 15 minute car processional out of the parking lot. We do care, however, about the idea of the toast and vehicle processional and enjoy remembering the initial excitement, just not the long tail of boredom. You, as a photographer, thus have tremendous power to influence others perception of events if you teach your camera to lie. For example, take this photo..
Not fine art, but much better: not because the situation or environment changed, but because we’ve lied about several things..
Movement. Look closely for “lines” formed by different objects in the first shot. It’s a chaotic mesh wherein the eye does know what to focus on. I don’t know what I should be looking at so my eyes are jumping all over the place. Am I supposed to be looking at the water jug? ..the dog? I have no idea. 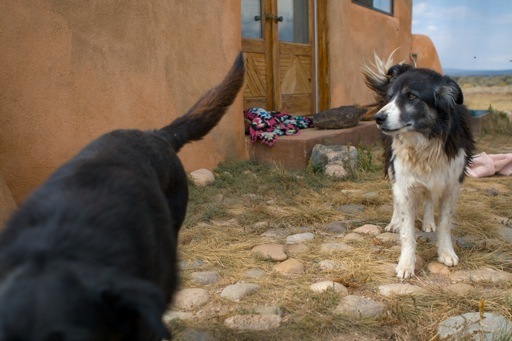 But in the second shot, notice how the diagonal line formed by the bottom of the house and the ground is mimicked by the step up to the door; by the dogs front feet; by the direction the dog is looking and moving; by the orientation of the two dogs. The movement of the entire shot eminates from the top right corner and radiates outward towards the other three. I know what I should be looking at and feel like something is happening because we’re created artificial movement. White balance. The first photo is fairly accurate in terms of of the ambient light quality. The light was slightly bluish, which also happened to match the physical temperature of being very cold. But I don’t want you to feel cold. I want you to feel warm and fuzzy and giddy about the purdy doggy. The second shot feels warm, like a bright, sunny summer day, even though it was nearly freezing and about to rain. Color. We’re pushed the saturation levels in the second shot to the extreme, but not quite so far as to detect our fib. Skies are not this blue, grass not this yellow/green, and adobe not this orange. Notice how every object has a distinct complementary color theme which is not intruded upon, as well as the exclusion of purple and red in the central theme. Framing and cropping. By removing unnecessary distractions, we’re left with only the photos core concept to dwell upon. The negative space of the barren wall, sky and ground have distinct textures but are mostly devoid of objects which would steal our focus from the subject. We’ve tried to frame the dogs according to the rule of thirds, and all unnecessary concepts which could have been removed in the moment, have been. Good photos are in the eye, not the technology, so you should strive to get great images straight out of the camera rather than rely on post-processing as a crutch. All of these concepts can be executed on a modern SLR and often only require post-processing for fine tuning. OpenRain will be launching a simple, online .ICC monitor color profile database shortly, and is looking for .ICC file contributions generated with hardware colorimeters. We’re also looking for administrators/moderators to add display models, remove bogus content, seek out .ICCs for missing models and suggest new features. If you work in the computers or graphic design space and would like to get involved for the sake of design professionals everywhere, hit me up! 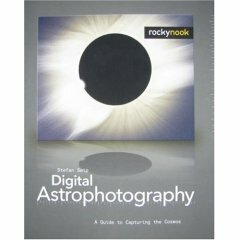 Rocky Nook — a digital photography book publisher in California — sent me a review copy of Digital Astrophotography: A Guide to Capturing the Cosmos for review, which I read over the last few months. A good overview of the techniques used in astrophotography. Largely easy to follow for the casual reader. Covers the entire process, from equipment to post-processing. I’m very well oriented with “typical” production and post-production photography methods, but was unaware of the additional complexities and tools involved with astrophotography. Casual SLR/DSLR and point-and-shoot users will not be able to suddenly get stunning frames of the night sky. It turns out that the equipment required to get decent shots requires a level of financial commitment to the niche you aren’t likely to make unless you have a professional need or really, really, REALLY like looking at celestial bodies. You’ll probably need a special mount for your camera, or build a jig yourself. I did not want to invest a significant amount of money, so I have been unable to try many of the techniques described. If you’re bad at math, you may find some of the technical setup difficult to follow. The tools covered are Windows applications. Bah. You are not planning on trying it for yourself but nevertheless have $20 of curiousity. Being creatures limited by our instruments of perception, the behavior of the human eye and related processing systems never ceases to amaze me. Last year was particularly enlightening, as I hadn’t previously realized we effectively cannot see color in low light situations. I honestly never noticed until I woke up one morning and realized that I’d used the blue towel instead of the red towel after the previous evenings midnight shower. Getting more heavily into photography has helped me understand the vast exposure corrections we make involuntarily and without consciously noticing. It’s simply not plausible to correctly determine proper exposure settings using the human eye alone. We adapt dynamically to different lighting situations, so your halogen lit living room at night–which seems like it’ll show well without a flash–will end up tragically underexposed if you “eyeball” the settings. 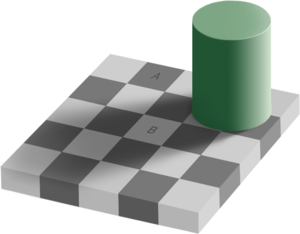 Perhaps my most interesting discovery of late is the checker shadow illusion: a great image demonstrating we often see what we’re expecting, rather than what actually exists. But then, “what actually exists” is a different issue entirely. I’m a Canon man, and I’ve tried some of the kit lens. They’re absolute crap. Images appear soft and with an annoying amount of chromatic aberration. Sigma’s lower-end equivalents such as the Sigma 18mm-50mm 3.5-5.6 DC Zoom are similarly poor. This crop of an overhead florescent light in the corner of a much larger frame shows how extreme the chromatic aberration can be with the Sigma model. While admittedly blown out, there is a very distinct purple color cast in the areas directly above and to the right of the lighted area. This was shot at f/3.5, 1/80s at ISO400 at 18mm (x1.6 sub-frame conversion). 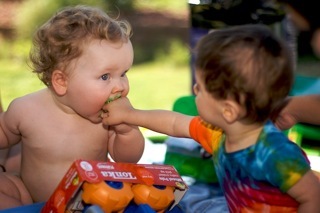 I’ve been completely satisfied with my Canon XTi and Canon EF 28-135mm f/3.5-5.6 IS USM . The 28-135mm is a great general-purpose, budget-friendly image stabilized (IS) walk-around lens. Image stabilization is well worth it, as you can get away with many hand held shots in low light or moving subject conditions which ordinarily aren’t possible.